A retractable awning is great for both summertime and winter use! When you think about types of awnings, the first ones that come to mind are likely the commercial awnings hanging over business entryways. They are delightful, professional and almost everywhere you look. But awnings can also be great for residential property. Retractable awnings are increasingly popular for many reasons. Are you considering one? Let’s learn more. A retractable awning provides shade and protection, and most conveniently are motorized. 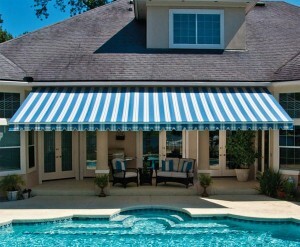 These awnings are attached to your home and don’t require bulky rods or poles. This means you can pop it up and create a perfect shelter and shade from sun or snow and enjoy your patio, porch or walkway space. Whenever you wish, you can conveniently retract it back. This makes having a retractable awning essentially hassle-free and flexible. You can even save on your heating and cooling bills! Sunesta: Sunesta Premium Class Retractable Outdoor Awnings can transform and expand your outdoor living area. They let sun in when you prefer it and deliver a comfortable amount of shade. They come in motorized and manual options. Sunstyle: The Sunstyle model offers complete customization, with extensions up to 11’6” and hundreds of fabrics and custom features to choose from that will make your awning perfect for use year round. Sunlight: This customizable overhead option features multiple add-on options and availability in five different projections up to 10 feet, offering complete sun control. Sundrop: Sundrop window awnings come in several different styles and colors, it won’t be hard to find out that flows naturally with the style of your home. They are functional and versatile, offering shade or sun when you want it. Screens: The Sentry Sunroll Retractable Screen allows you to have complete vertical sun control of your covered outdoor space. Whether you are covering your windows, doors, patio or lanai, The Sentry can fit your unique space with widths up to 24’ and heights up to 12’. Shelters: The Suncover provides sun protection to an existing structure like a sunroom, pergola or skylight. It is easy to add to the existing rails of a structure without having to mount any part of the shelter to a wall surface. The Sunplus is similar to The Suncover, but includes larger aluminum side rails with rain gutters. The Sunplus is installed to a wall or soffit and supported with uprights at the end of rails. When extended, The Sunplus can offer additional protection from rain run-off to the front. The Shadespot is a freestanding option that offers up to 600 square feet of shade anywhere you decide to put it.